Cycle the city in style. The Cube Editor is an urban hybrid sports bike that combines practical cycling utility with stealth looks. With an ultra-low maintenance 11-speed drivetrain, combined with a lightweight frame and hydraulic disc brakes the Cube Editor is ideal for all sorts of city cycling. We had one goal in mind when we set out to design the Editor: make the ultimate urban assault bike. Ultimate looks, ultimate comfort, ultimate speed, ultimate practicality. That's why we gave it an advanced aluminium double butted frame, then paired it with a sleek rigid fork. It's the reason we didn't compromise on the transmission, selecting Shimano's superb Alfine 11 speed hub gear and combining it with a Gates belt drive for silent running and practically maintenance-free performance. It's the thinking behind the powerful Shimano hydraulic disc brakes, which offer reliable stopping in even the wettest of conditions. And it's also why our engineers refined the mudguard and luggage carrier mounting points, so that your bike retains its good looks at all times. Because what use is performance, if you can't have it with a big dollop of style on the side? 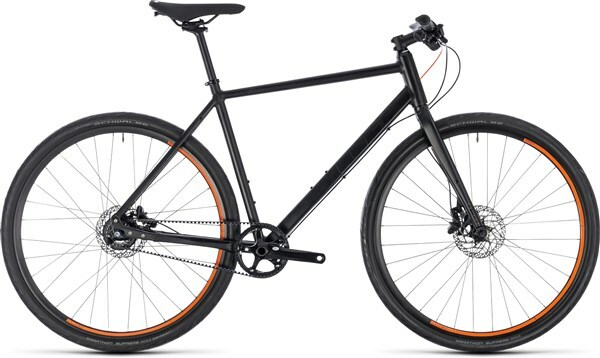 Why is this frame so comparatively light amongst urban bikes? Well, only our engineers know the precise reason for that (and they're not telling). But we know enough to be able to tell you that it's got a lot to do with the double butted aluminium tubing, which saves weight where it's not needed without compromising strength or stiffness. We can say that with certainty because, like all our bikes, the Editor has passed stringent testing in our own laboratory to ensure it'll withstand hard use. It's also been specially designed to cope with the specific demands of the Gates belt drive, with a Split&Slide dropout enabling an easy belt change and a super-reliable, super-easy belt tension adjuster. We even found room for two bottle mounts, so your weekday urban sidekick can double up as a weekend companion in the country. Did we think of everything? We reckon we did. Headset: FSA Orbit Z semi-integrated 1 1/8"